These round airtight Onyx food storage containers are amazing! They are made from #316 (18/10) food grade Stainless Steel, (The best of the best!) and the lid has a silicone seal. The containers are completely air tight. 4.75 cups = 1.1 L.
This thing is great. Way more lightweight than the glass containers I usually use, but just as airtight. I love this one. 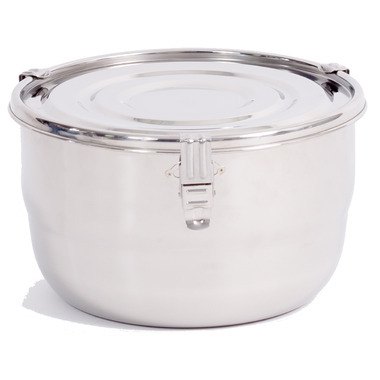 Great size for salads, veggies, etc. Environmentally friendly, lightweight and leakproof. Love this product! Well made a light weight. Perfect alternative to plastic containers. Perfect container for my salad. It is definitely lighter than a glass container and it keeps everything sealed. I highly recommend it! I love Onyx containers. They are a great alternative to plastic. They seal tight so liquids don't leak. They last a long time (I've had a set for about 7 years and they're still going strong). Love this product. We own a few. Excellent product. Sustainable material. Hard-wearing. Seals really well. Can be heated in the oven (WITHOUT the lid). I have quite a few of these and they are the best!